Looking through my archives, Hillary Clinton rarely has been the target of political humor. I did share a quiz last year that definitely had a snarky tone, but the main goal was to expose her extremist views. Similarly, I mocked both her and her husband that same year for plotting to minimize their tax burden, but I was simply calling attention to their gross hypocrisy. 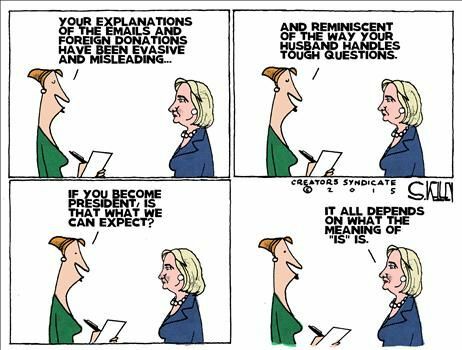 The only pure Hillary-focused humor I could find was from 2012 and it wasn’t exactly hard hitting. Well, it’s time to correct this oversight. Thanks to the bubbling email scandal, we have lots of material to share. Let’s start with a video from the clever folks at Reason TV. 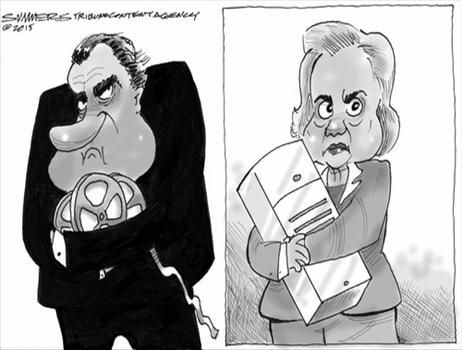 Needless to say, cartoonists also have had lots of fun with the former Secretary of State’s dodgy behavior. And here’s how Dana Summers assessed the situation. 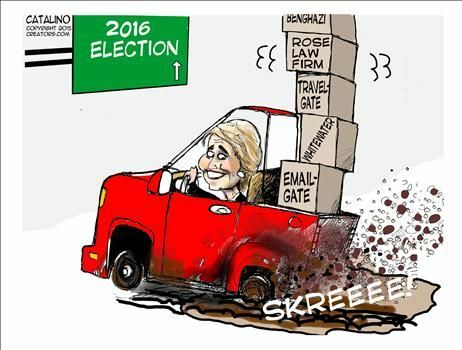 And Ken Catalino reminds us that Email-gate is just the tip of the iceberg when looking at Hillary scandals. 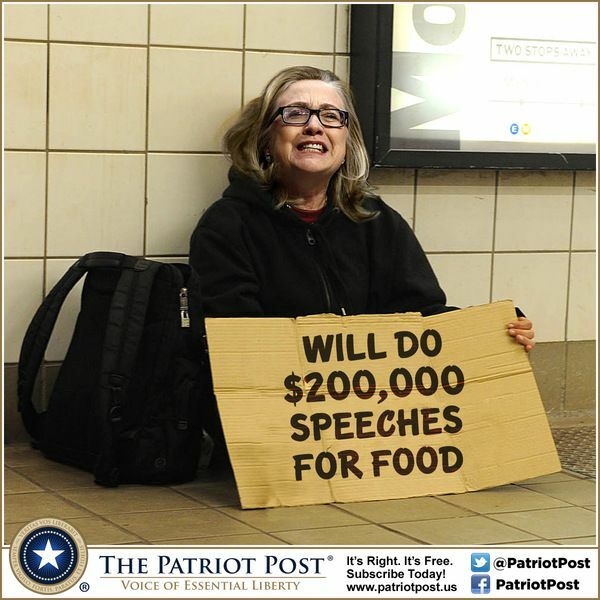 And since we’re have some fun with Mrs. Clinton, here’s someone’s clever photoshop exercise, calling attention to her habit of extorting huge payments for platitude-filled speeches. And here’s a bit of humor that has a PG-13 rating, so in keeping with my tradition, it’s minimized so only folks who enjoy such humor will go through the trouble of clicking on the icon. The rest of you can continue below. P.S. Hillary Clinton is portrayed as the “establishment candidate” for the Democrats. Some people interpret that to mean she’s a moderate, particularly when compared to a fraudster like Elizabeth Warren. But if you check out these statements, you’ll see that she’s a hard-core statist on economic issues. Indeed, there’s every reason to think she’s as far to the left as Obama. P.P.S. Bill Clinton, by contrast, did govern from the center. Sure, his reasonable (and in some cases admirable) track record almost certainly was a result – at least in part – of having a GOP Congress, but you’ll notice that Obama hasn’t moderated since GOPers took control on Capitol Hill. 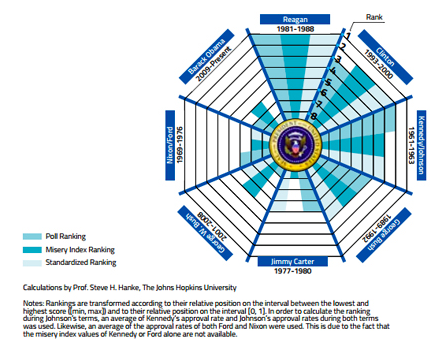 For more evidence, check out this interesting (albeit complex) graph put together by Professor Steve Hanke. You’ll notice that Bill Clinton’s pro-market record generated results similar to what Reagan achieved (and Michael Ramirez makes the same point in this cartoon). Needless to say, I fear that Hillary Clinton would be more like Obama and less like her husband. P.P.P.S. In addition to his decent performance in office, Bill Clinton also has been the source of lots of enjoyable humor. You can enjoy my favorites by clicking here, here, here, here, here, and here. It’s not Remy’s first bite at the apple, though! I like granny Clampett… now there was a woman of stature… who didn’t like revenuers or blue coat Yankees… she supported the second amendment… and adored her double barreled 12 ga… what a pity we don’t have a woman like that to run for president… a woman of genuine character… and substance… a gift from the hills………………..